Prepping Tip 1: Choose a Wood and Deck Cleaner if gray, dirty, reapplying the same stain, etc. Prepping Tip 2: Choose a Stain Stripper if you have a failed stain that has peeled or worn unevenly. Prepping Tip 3: Choose a Wood Brightener to neutralize the wood cleaner or stain stripper. Staining Tip 1: Choosing a stain with a "color" will prolong the graying. The darker the color, the longer it will last. Staining Tip 2: Choose a semi-transparent or semi-solid deck stain that penetrates into the wood grain will make future reapplication easier. 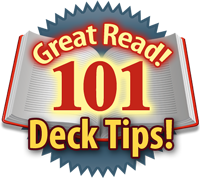 Staining Tip 3: Our most popular deck stains are the Defy Extreme, Armstrong Clark, and the TWP Stains. I followed your advice and applied 1 coat of TWP stain last summer to my brand new pressure treated premium grade pine deck. How do I proceed now to apply the 2nd coat to get it ready for summer? Will hosing it off be enough cleaning? No. Light scrubbing or pressure washing. Use some soapy water. We live in Toronto Canada and have a cottage in Muskoka. The decks are Cottage 1) 1220 sq ft 2) 375 sq ft and Home 600 sq ft. Which cleaner/brightener should I use and how much should I order? Which stain is best, semi-transparent or solid? My wife is thinking of Armstrong Sequoia, Oxford Brown or Rustic Brown or TWP200 Butternut or Slate Grey. She does not like a reddish tone to the stain. Which would you recommend and how much should I order? How long will it take for me to receive the order and how do you ship to me in toronto, Canada and what is the shipping cost? 80 degrees today. Down to 49 degrees tonight. 80s again tomorrow. Is it ok for me to stain my deck today with TWP? Yes, you are good to apply the TWP! Thank you. I did it and it looks wonderful. I love the TWP stain.